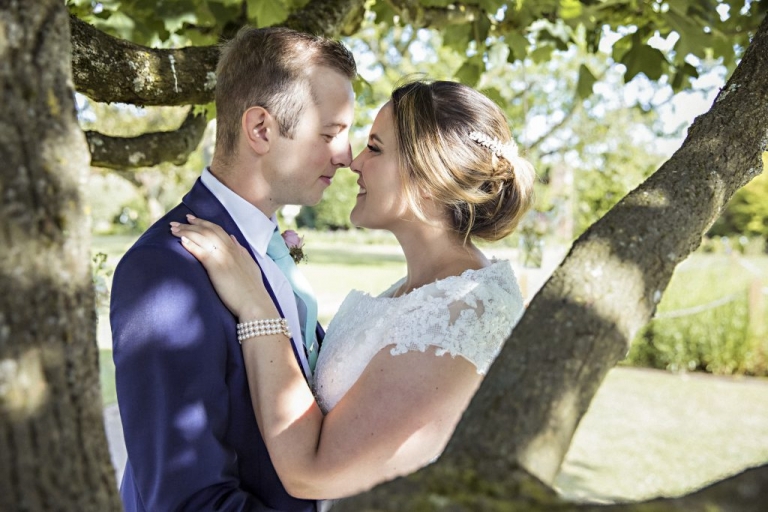 Hertfordshire wedding photographer- My guide to getting perfect couple shots ! Couples shots can be nerve wracking for a couple on their wedding day, but thats where a good wedding photographer comes in. We need to have ideas , we need to be creative, we need to use our surroundings to get the pretty shots, the WOW shots, but most of all, we need to be able to put the couple at ease. Speaking from experience, stress always shows, awkwardness does not a great picture make! By the time I get round to taking couple shots, the bride and groom are still feeling overwhelmed by their day, they need direction, they need laughter, they need to feel relaxed! Here are some examples of what I believe, as a professional wedding photographer, makes the best couple shots, which really (I feel) is the most important part of your photographic story, its both of you together, in the moment, on what is really, the best day of your life…..
You can’t beat a great ‘kiss’ shot, its a chance for a couple to really be in the moment with each other. I especially love her smile in this one, theres no awareness, no stress, its perfect! We are very lucky as wedding photographers that we are almost certain to be surrounded by beautiful things. I really try to use my environment to make a good picture even better. This lovely shot of Grace and Rory under a tree was taken as the sun was slowly setting and it really frames them and shows how relaxed they are. The champagne also helped…….. I do love a doorway, the prettier the better! 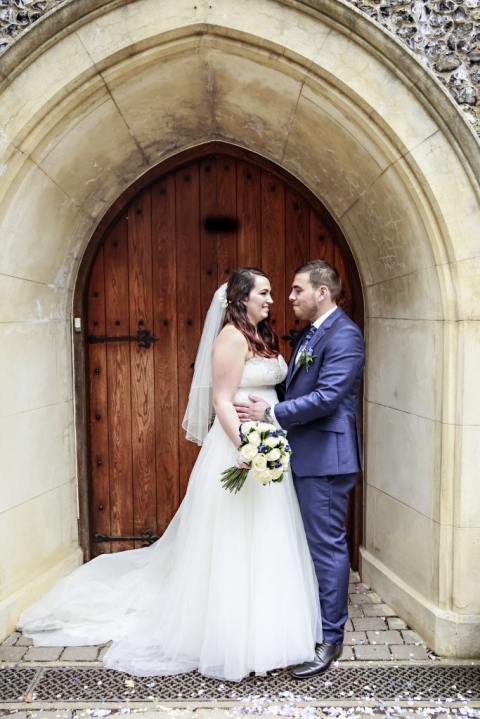 Church buildings are fabulous and this doorway really frames the couple. This shot was taken at The Twelve Apostles church in Hertfordshire which is a Greek orthodox church. Full of tradition and great for couples shots. Lets go for a walk ! Its as simple as that, a little stroll hand in hand (with a great background) makes for a perfect shot. I always tell my couples to have a chat and interact, they have so much to talk about of course, its their wedding day! 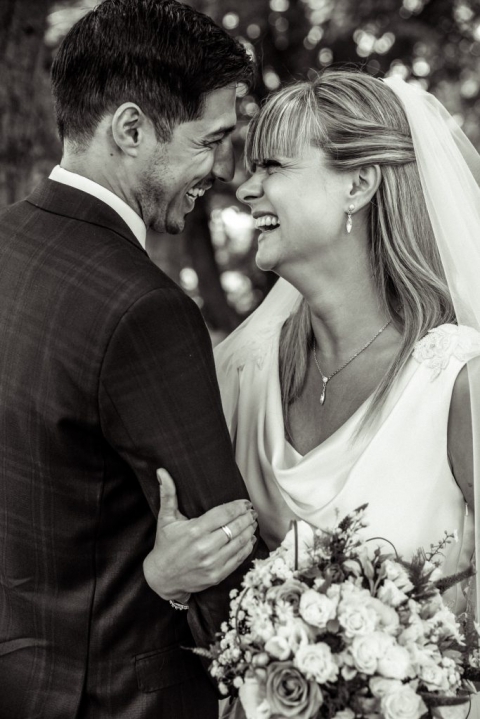 For this shot its very possible I shouted ‘Look at each other and laugh!” Sounds cheesy but….. it always gets a great shot! You do feel a bit silly at the time but its worth it.. I promise. This one was tricky, it was a November wedding, so I had no daylight when it came to the couple shots. I used my off camera flash for this one . This particular bride was quite nervous and was getting quite stressed about it all. To help her relax I instructed the best man to stand to the side of me and yell insults at her new husband, she loved it and I got this great shot! There are various moments throughout your typical wedding day that can be quite repetitive and boring. Signing the register is one of them. I love this shot because she spontaneously sat on her new husband’s lap and it made the shot that much more interesting and fun. Flowers please and loads of them, the more colourful the better. Flowers just make a good shot even better and who doesn’t love flowers? Explore your surroundings! This lovely couple chose to celebrate their wedding breakfast at a pub in London on a main road! Not so great for couple shots. Lucky for me, I discovered this little courtyard in a side road and stole the couple away for a few moments and got this lovely shot of them together. A good solution for many weddings shot in urban London and its surroundings.